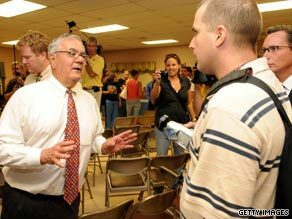 A town hall session held by Representative Barney Frank has joined the pantheon of straight-to-video moments from the rowdy face-offs on health care this month. But instead of a critic’s shouts, this time it was a zinger from the Massachusetts Democrat that drew the most notice, replayed repeatedly yesterday on cable TV news. 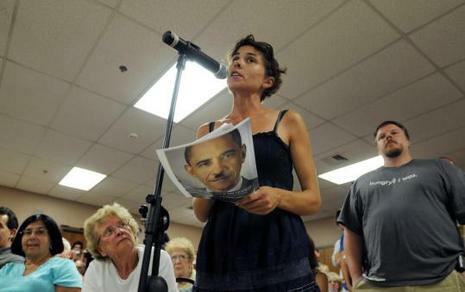 His event Tuesday night in Dartmouth drew more than 500 people, who asked how the nation could afford a health care overhaul and some of whom protested a bigger government role. He admonished those who were shouting, saying that prevented a serious debate on the issue. The crowded hall had both supporters and detractors, but the opposing side was much louder and more raucous, booing the Massachusetts Democrat from the moment he was introduced and shouting questions and challenges at him throughout.